48 Hours Left to Vote for Roman Remains on The Freshmen! Calling all fans of Roman Remains and The Duke Spirit! 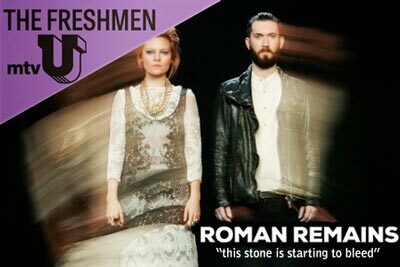 This is a mid-week reminder to keep voting for Roman Remains in this week’s mtvU The Freshmen competition. Their high adrenalin single/video “This Stone Is Starting To Bleed” is up against some stiff competition, but we’re confident we can pull this off if everyone keeps the voting up. As you know, if they win the video will be added into regular rotation over at mtvU, so the stakes are high. This message is a call to arms for all supporters of both bands to follow the link below and vote as many times as you possibly can to secure this great opportunity for Roman Remains.